I'm looking to move to FTTC very soon. I want to keep my wireless network working with Apple's Airport as I am very happy with the products. If I am supplied with a wireless router, Home Hub or similar, can I bypass this and should I also replace the modem as I believe some have suggested? I'm currently considering a move to BT, PlusNet or staying with IDnet and switching to their FTTC packages. Weighing up cost versus service for mainly streaming TV. Advice and recommendations always welcome. You will have a modem installed and then you can either connect the BT Home Hub or a router of your choosing to it - it will need to be one with an Ethernet based WAN interface. You then connect the Apple Airport to the router and then decide whether or not you want teh router's WAP to be turned on or off. I have installed many WAP that work alongside a router with it's own WAP - some turned on and some off. There is enough flexibility for you to choose your own set up. The Apple Airport is a router1... the OP can just connect it to the BT modem. 1 Though if it's an Express rather than an Extreme it's not much of one. When you move to FTTC (irrespective of the provider), OR will install a FTTC-capable modem. Some ISPs may also offer you a router to connect via cable to the modem. BT provide the HomeHub and installation includes set up. Whether you use the OR-provided modem is, at the end of the day, a matter for you. I use a Fritz!Box and all my Apple devices connect seamlessly to it. A single modem/router is one box and I get all the DSL information that I need without having to hack a modem that I do not actually own. Looking at Apple's support pages, you should be able to connect your Apple Airport to the FTTC modem. As far as providers are concerned, this is one for you alone to judge based on a number of considerations such as forecast usage and cost. There are plenty of views about particular ISPs on this site and on others. That said, FTTC connections seem to attract a lot fewer adverse comments than old ADSL lines. I consistently get 75/16.5 Ping 20 on my line and I am 300M away from my FTTC cabinet. My router shows that max attainable speeds are in the order of 100/32. 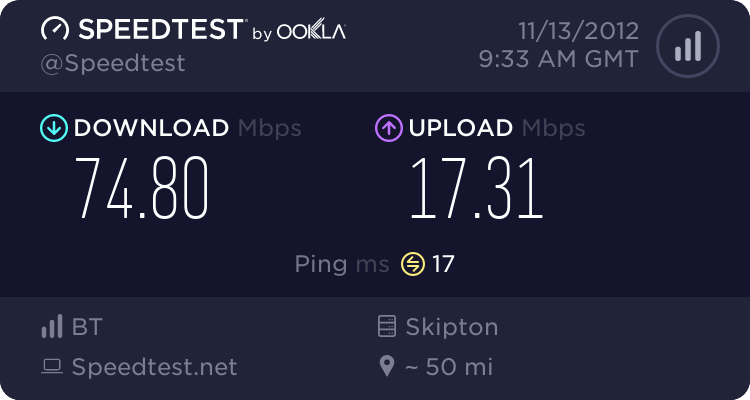 FWIW, I am with Zen and apart from a minor glitch with my FTTC product on setup (which they corrected within 12 hours of me pointing it out), they have more than met my expectations. The only MAC Airport I have connected have only had Wireless capabilities so were probably the Express. Start of with the fact that I'm a lite user - under 10GB pm. I moved in Feb 11 from O2 LLU at 5Mbps to IDNet Fibre Starter, which at that time was 40/10, and was perfectly happy with the service. I went to them mainly from nerves about the mass market alternatives. The price was £28 or so per month, but by paying the year in advance it reduced to £23.82 pm averaged out as one month was free. In Feb 12 and with Plusnet seeming to make big strides in their offerings and CS, I bit the bullet and migrated to their 40/2 service, which was all they had at that time. £16.49pm. I chose them over BT Infinity because of the infinitely better help and information provided by PN sales staff compared to their BT counterparts. I have had no regrets, bar a tiny wish for the 10Mbps upload for the couple of times a month I upload for a few minutes. Hardly a crying matter. I had a small whinge about this in some thread on these forums, similar to yours, and a Plusnet rep saw it. I was offered a free go on the 80/20 trial and went for it. As a result, although I have no need of the speed, when their 40/2 product was upped to 40/10 still at £16.49, and the 80/20 one was announced at £19.99, I decided to pay up. I am very impressed by Plusnet, where once I was a strong critic from outside. I can see no reason at all for anyone paying niche ISP prices instead. The decision has to be between PN, Infinity, Sky and TalkTalk.